I feel like I should start with some sort of tuberose disclaimer here; Fragile is not the tuberose it claims to be, and I wouldn’t technically classify it as a tuberose. Instead it is an unusual floral that showcases a contrast between cold and warm. Fragile is a peculiar perfume, it is, unlike it’s name suggests, not ‘Fragile’, but there is something, quiet and reserved, even withdrawn about it that makes it interesting. Fragile’s opening is cold and austere. It starts with bright, indolic flowers with equally bright bergamot, spices and menthol. There is a good degree of pepper (thankfully not of the pink variety) that livens things up slightly, but the overall affect is cool, aloof and as classic as a couture gown. The florals in the heart are a perfect example of an abstract bouquet. This golden bouquet features the cool green of jasmine, bright indole of orange blossom and hot flesh of tuberose. Wearing Fragile is like taking a moonlit stroll through a field of flowers, each one sparkling and dancing under the moonlight. Fragile warms considerably with time, and what at first seemed cool and aloof soon becomes sensual and comforting. The florals are supported by a wonderfully rich base of dry woods, vanilla and cinnamon. It’s creamy, spicy and slightly bitter all at once. The base is incredibly elegant, there is a confident warmth to it that feels surprising when compared to the withdrawn nature of the opening. Fragile feels opulent and almost baroque. It’s funny, I had intended to add Fragile to this series for quite a while but hadn’t gotten around to it and it’s been a really long time since I wore it. Spraying it on over the last few days has really reminded me just how beautiful it is, and how there isn’t really anything else like it. Fragile may not be a narcotic tuberose diva of the night, but it is a wonderful composition that shows that the ‘Queen of Flowers’ can remove her crown and sit amongst her floral comrades quite happily. Jean Paul Gaultier is known for packing his perfume in the most unusual of vessels; male and female torsos, magnetic bottles and a dali-esque face that also doubles up as the silhouette of a male torso. His best bottle however, belongs to Fragile. 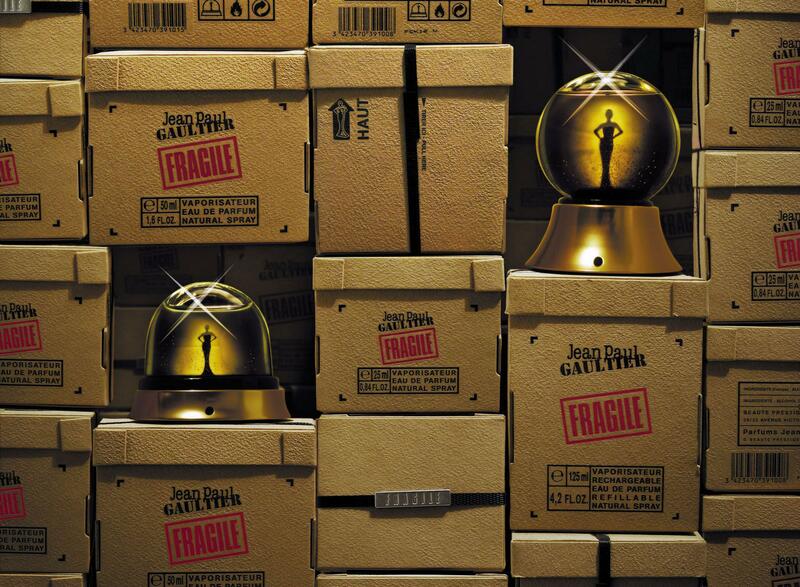 M. Gaultier is the only person that could get away with housing a perfume within a snowglobe, but it works, so well in fact that one is left wondering why no-one has done it before! A couture-clad woman stands inside the globe amongst falling sparks of gold. Beautiful! 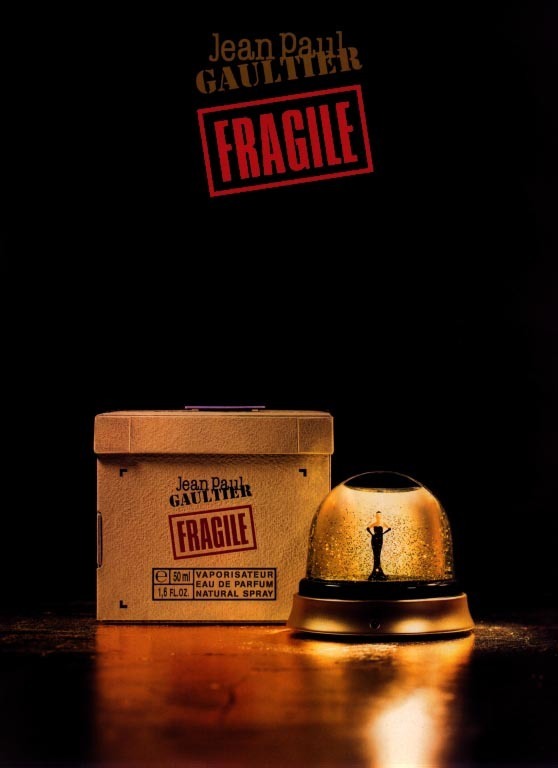 It’s true that Fragile had big boots to fill, both Classique and Le Mâle had been (and still are) massively successful, and whilst it isn’t dull, I don’t think Fragile was daring or innovative enough to hook people. At the same time it certainly can’t be considered to be a crowd pleaser (like Classique and Le Mâle), instead it sits somewhere awkwardly between dull and fascinating. Describing Fragile as a tuberose was also a mistake. Those looking for tuberose would have been disappointed, it’s there but it’s not prominent enough for it to be headlining the composition. 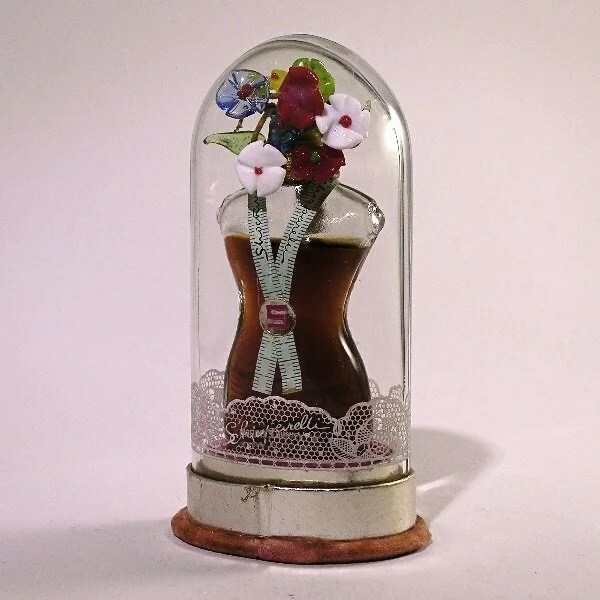 Also, the bottle probably didn’t help, as is always the case with those discontinuations, many people saw it as gimmicky rather than kitsch, which is a massive shame because I think it is one of the greatest perfume bottles of all time. The Eau de Parfum is very difficult to get hold of nowadays, your best bet is eBay, but it does occasionally pop up on the discounters or sales boards. The Eau de Toilette is easier to come across but it isn’t anywhere near as nice. This review is based on a bottle of Fragile Eau de Parfum from my own collection. 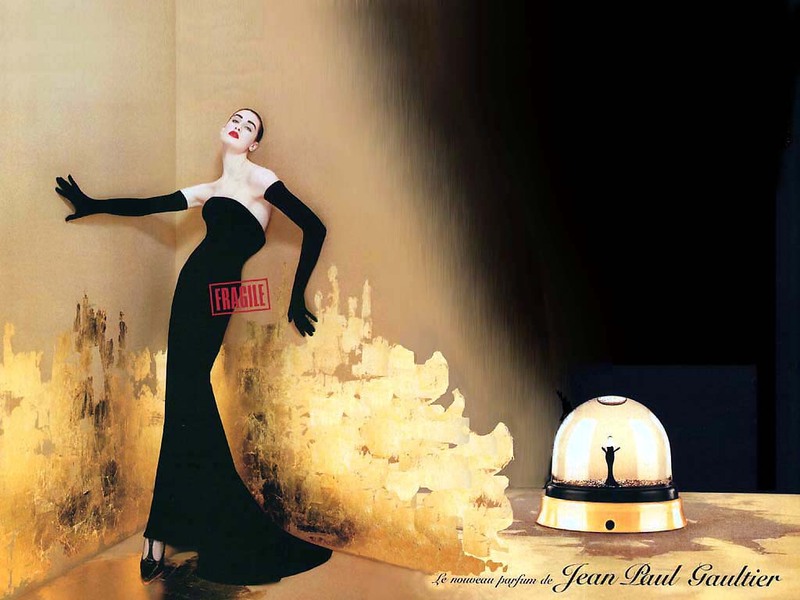 Posted in Feminine, Floral, Gone But Not Forgotten, Jean Paul Gaultier, Perfume Reviews, Woody and tagged But Not Forgotten Series, Feminine, Floral, Fragile, Gone, Jean Paul Gaultier, Tuberose, Woody. Bookmark the permalink. Oh, that bottle! That bottle! I love it so! Thank you, this review has brightened my day! Actually I think Gaultier got his inspiration for bottle design from Schiaparelli. BOTH his famous women’s perfume bottles actually. I hope this link to the image works. I can’t remember how the perfume smelled, but your review wants to make me go looking for it. It’s a beautiful bottle isn’t it? I have a 50ml which is the exactly like the one in the third picture above, but the 125ml was a full snowglobe and was even more beautiful. I always regret never splashing out on one. I’ll put a little spray of Fragile in with your Lipstick Rose. I had it quite some time ago – around the time it came out. I loved it! Now, I barely remember the way it smelled, but I am sorry to learn it’s been discontinued, I think it was a good perfume. It seemed to disappear from shelves quite slowly, which is why it’s discontinuation seemed to fly under the radar. Love, love love the bottle, this was not one that I ever bought or can even remember smelling??? I owned classique because it was fashionable to do so, not because I had any real love for the perfume which goes to show how well the marketing worked back then. I get what you mean with Classique, the marketing strikes the right balance between gimmicky and good, the bottle is a must-have. I own a bottle of Classique but rarely wear it. Fragile sounds really appealing, and that bottle really is fantastic (would look so nice on my cabinet). I’ve been feeling gratitude lately towards well-done mass market and mainstream stuff, and it sure sounds like fragile fits the bill! Ever the great enabler/lemming-maker, that’s me! It really is appealing, and it would be a good tuberose for those who aren’t overly keen on it. I would add it to my guide if it were just a little bit more tuberose-centric, but there isn’t enough for it to be considered. Sometimes I think the well-done mass market/mainstream stuff is the best! Aha, a tuberose-leaning scent that I’ve never smelled… I might go and haunt ebay to see if I can find a bit. Or stalk it at TPC. I have some Versace Blonde parfum that is strikingly Fracas-esque – have you tried that? I haven’t tried Versace Blonde but it sounds like something I’d like. Is it completely outrageous? Best bottle ever ! I especially like it’s kitsch factor. :o) – I too thought, “hey why hasn’t anyone else think of this before”. It just feels so obvious and appropriate for a “display perfume bottle”. It would definitely be a disappointment to tuberose lovers! Luckily for me I tried it before I even knew what tuberose was, so I was able to enjoy it fully. I shall hunt down a sample of Blond, it sounds pretty fab and I’m always up for a brash and loud tuberose! I wonder if I can find this anywhere. I had never even heard of it and it seems COMPLETELY up my alley. Great review! As a long time lover of snowglobes and perfume, I am gutted that this isn’t in my collection. Must have been asleep at the wheel. I do hope another perfumer is inspired to go down that route. I’d buy Eau de Blackpool (salt and candly floss? With a hint of WKD?) or Britney (or Christina, Mariah, or Kate’s) sweetened vase water if it came in a bottle like that. Would be so much nicer to find a lovely ‘fume inside. Haha! I love your ‘Eau de Blackpool’ – it perfectly captures the spirit of that particular seaside town. BTW not dissing Blackpool, I love everything about it! It’s a guilty pleasure. Although our family who live down there always claim to live in another borough! I don’t get on with JPG scents at all as a rule, and though I appear to have swapped away my sample of Fragile, I do distinctly recall that this scent was better than the rest – not so plasticky and bombastic – well, fragile basically, and quite intriguing. It may even have been my first exposure to tuberose, right at the start of my hobby. I’m exactly the same as you, it was my first exposure to tuberose and I think you’ve hit the nail on the head with Fragile – it’s decidedly more refined than the other JPG’s. Oh no! Another one discontinued. This perfume is so much better than Classique! Hi, this has been my signature scent for years. Do you have any ideas for something else that i may like? I purchased a bottle of it online recently which was obviously very old as the scent had expired and smelled terrible. After some research, I also purchased a bottle of Gucci Flora Gracious Tuberose which I thought could be some sort of a replacement, but I hate it! I know this may sound a little dramatic, but I am devastated and desperate. Any suggestions would be greatly appreciated! please bring back Fragile, its so awesome and like Amelia above would appreciate some ideas of something similar. I wear Fracas now which is great but wonder if there is something else?…. I wish they’d bring it back to, I genuinely don’t think there is anything else like it. I have the 125 ml bottle with the full snow globe. When it first came out, I KNEW I had to have it! I could resist. I was a poor grad student at the time, but somehow found a deal and got my Fragile! I still have it and it is a proud member of my collection. I have just been racking my brain as to what the sample of acqua di Parma gelsomino Nobile I was given today reminded me of and I am sure it is Fragile. Hadn’t worn it for years such a fabulous fragrance. The acqua di Parma does have the same mix more or less Calabrian jasmine, Italian mandarin,pink pepper,tuberose, orange blossom,cedar wood and musk. I loved it instantly trust me to love something so damned expensive! Ooh I need to sniff it then!